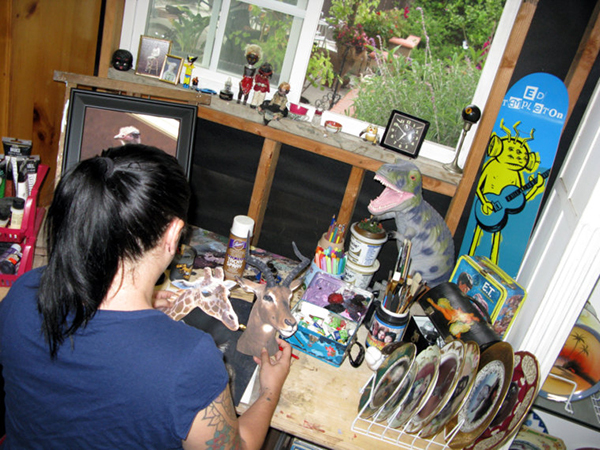 Angela Rossi is the artist behind Beat Up Creations, one of our favorite lines we carry at Spitfire Girl. 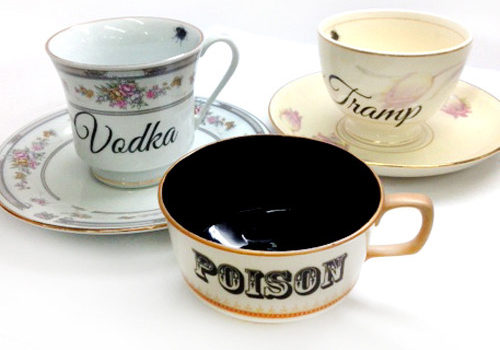 We love her antique altered plates and teacups because they’re humorous, sometimes morbid, and always weird! We love that Angela works with recycled, abused, broken, and forgotten items, and transforms them into one of a kind creations that are nostalgic with a twist. We wanted to learn more about her work and process, so we reached out to her with a few questions. How did you get started with Beat Up Creations? This idea of the Altered Antique Plates started because my mom was an avid antique collector and dealer. 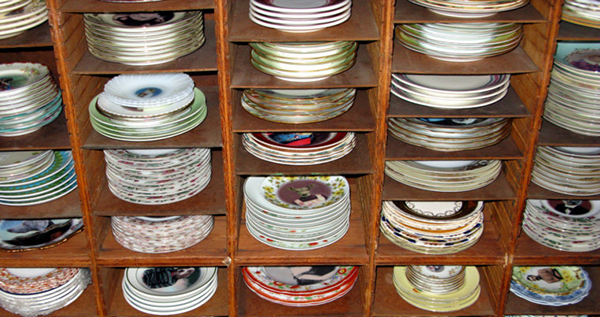 When she retired she began getting rid of lots of stuff, in that “stuff” was many old plates. Some of which were old portrait plates with demure ladies posed in proper positions and big fluffy dresses. They were all beautiful with hand painted details, gold accents, and delicate porcelain but in reality they did not exactly match my modern, urban style. So, were they useless? No, I must make them cool again…. atlas the idea began. What are some of your favorite images to work with? The juxtaposition of highbrow classicism with a sense of humor is really my goal in creating the plates. I love the contrast between the old vs. new, pretty vs. ugly, soft vs. hard. I love the working with images of punk rockers, circus freaks, animals in clothes, monsters, zombies, famous rebels, sci-fi characters etc. What has been a favorite moment in your career? Shop Beat Up Creations in our stores and online!